Send a healthy West Coast offering with fresh fruit and creamy cheeses. Overflowing with apples, tangy oranges and hearty pears, this classic basket holds everything needed for a farm fresh feast. Enjoy your fruit with crisp organic crackers and a pair of organic cheeses from the famous Sonoma valley. This beautiful basket comes tied with a colorful bow. 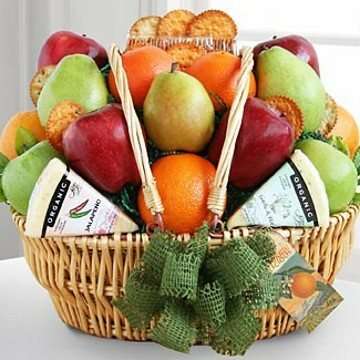 This gift includes the following: Sierra Nevada Organic Jack Cheese, Sierra Nevada Organic Jalapeno Cheese, 4 Oranges, 3 Pears, 4 Red Apples, 2 Green Apples, Wheat Crackers.